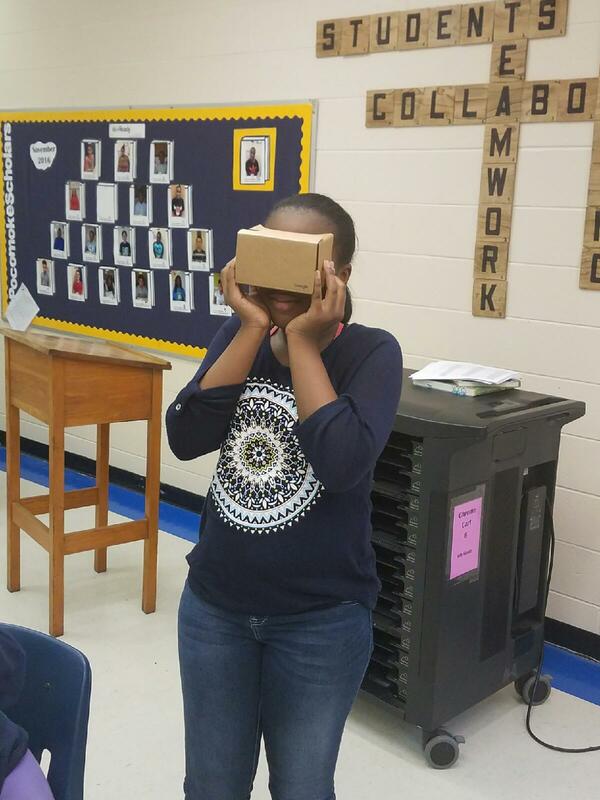 One #PocomokeScholar ignites her background knowledge by using Google Cardboard. The tool allowed students to develop new knowledge and understanding of one facet of an informational text. I often talk about being wired differently to my colleagues and state our students are even wired more differently than me. Therefore, employing the same pedagogy is only getting old results — unengaged, bored students. It wasn’t easy, but I was ready to take a new risk today. I could tell when the day began, it was going to be difficult. The network moved at the rate of a hibernating bear, and I was losing signal more than I wanted to admit with the Chromebooks. But I was determined to break down one barrier today — poverty. Not making excuses, but students — especially mine — lack background exposure to many basics. However, I wasn’t going to let t hat be today’s barrier. I concluded during my lesson planning it was difficult for students to know the difference between captivity and being free from the lens of a tiger. Photographs and sound effects lack a wow factor, which is needed for many digital natives. I wanted to empower their learning with a memorable experience and be able to access that experience was only the beginning. Over the summer, I purchased an inexpensive ($15) toy called Google Cardboard that is used for virtual reality (VR) learning experiences using my iPhone (or an Android works too). I played around with it a lot, but wanted it to be a tool that students could gain new, unfound knowledge with and run. There were a handful of VR apps out there, but I went with Discovery Education VR because I believe it will be an evolving tool due to the noise Discovery is making in educational technology. Source: Example of placing iPhone into Google Cardboard. I chose the Experience the Elusive Tiger because it supported the informational text “Emancipation: A Fable” by Kate Chopin which looks at a lion’s decision on whether to leave captivity when a cage door was accidentally left open. My class discussed the pros and cons of being in captivity and being free in the wild. However, the words not the page did not jump out at them as many were lackadaisical, but I asked for a volunteer (with their eyes closed of course) and placed the Google Cardboard on their face to hold. The students experiences a virtual jungle where lions roamed free and walked right up to them. The collection of 3D image panoramas and videos allowed my student to explore the setting, which was valuable to the text. One at a time, volunteers came forward and determined the setting affected their decision as the lion whether to stay in the unlocked cage or freely explore the wild outside captivity. The Google Cardboard was a mechanism to turn lethargic into intrigued and transformed their knowledge. Share is in today’s pedagogical risk below. Today, I wanted to break down a barrier of having limited background knowledge and offer an innovative way of learning. It worked! By lunch, other teachers were coming down to see what students were talking about. At that time, I shared how Google Cardboard might work in their own classroom. I hope this was more than integrating a technology tool and setting up a platform to dive deeper into learning experiences with students. Google Expeditions: Take a virtual field trip to a museum, college/university, space, etc. The Expedition has highlighted different key points of learning; it also allows for the trip leader to annotate the screen…very cool! Virtual Reality You Tube: It seems newer, but allows others to upload their VR experience. Let’s face it, common people make the best ideas. Furthermore, this might be a location where my students can make their own VR moments to share with the world. This entry was posted in Instruction, Technology and tagged #pocomokescholars, Discovery Education, Google Cardboard, Risk Taking, VR. Bookmark the permalink.